Vobbler is a shad ... No, sorry ... Vobbler is the Shad! The body rolls during the retrieve, the tail will start moving as soon as it'll touch the water, will keep moving even during the fall, even if used weightless. The results are stimulating vibrations, but primarily lots of catches. The hydrodynamic shape and the colors are developed to perform on all the main top predators. 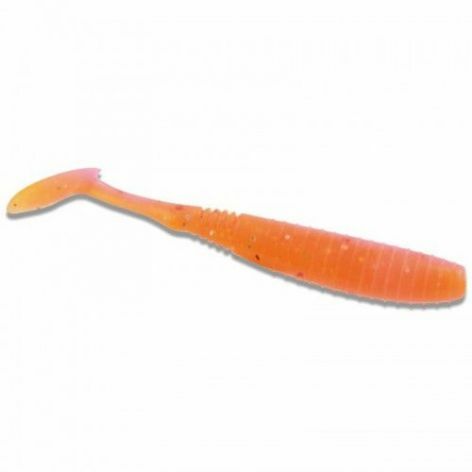 Also this series is made using the SSI, Salt & Scent Injected, but the mix was produced Specifically for this lure, Because the shad patterns need a very resistant mix, but soft. Our tests on black bass, sea bass, pike, trout and perch stated That the Vobbler soft lure is a phenomenal shad, rigged on jig head, Texas rig, Alabama rig, drop shot and more. Great to be fished on straight vertical or retrieves it proved to be exceptional in every fishing conditions.